I'm new to Korean dramas and songs, just finished watching the K drama My Girl a few weeks back and loved it! I'm desperately looking for the DVD box set for this series, anyone knows where to get the original copy of the Region 3 version of this drama? I've checked YesAsia, and it's out of stocks. Well, worse comes to worst, I suppose I'll have to settle for a bootleg version, which is undesirable because the English subtitles are usually bad. Anyway, been scouring all over the net for the different versions and here are a few versions I found. Any idea which version is good enough for a bootleg? Thanks alot! ^This version was released by PMP Entertainment. They're a malay company that releases dramas with english subs and package that are ok.
^I think this version is bootleg. ^This version is bootleg for sure so probably the subs and the picture quality isn't good. 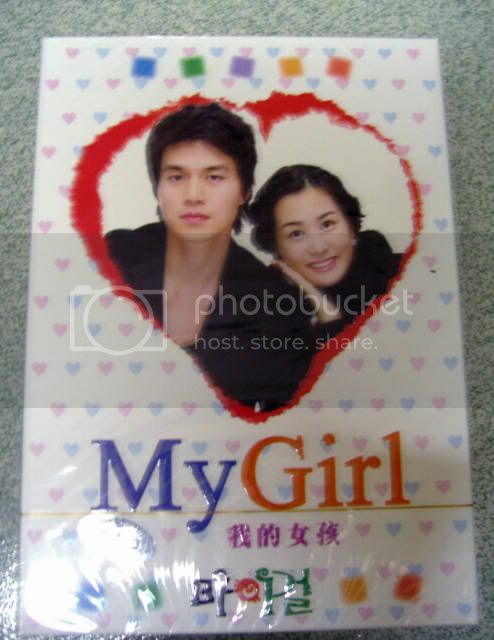 ^this is the official and original released dvd box of 'My Girl' for USA. I have this version and the subtitles are great! The image quality is also great! The only problem about this version is that it doesn't comes with extras (only 20 min of the 1rst episode of 2 other series) and they released in fullscreen instead of widescreen. But besides that, it's a good release. And you find it for the price of around 50 dollars. Rasckita, thanks so much for the help! I've since been able to get a second-hand copy of the original Korean DVD box set for My Girl released by YesAsia which comes with the extras too, and I'm really happy about it! Even managed to get the original soundtrack (which I understand is also out of print) from the same seller, I guess I got lucky! Thanks for the help anyway, and My Girl rocks!